The fully portable, plug-and-play Pogo Alert speed camera detector combines GPS and Laser technology with cutting-edge design and a high resolution 1.8-inch TFT colour LCD screen. The Pogo Alert will warn of ALL fixed speed cameras and in addition, alerts are provided for mobile laser traps via the supplied laser detector module. The Pogo Alert also includes patented features such as 'Directional' feature that provides warnings only for speed traps in the direction of the user and 'Limitator' feature that provides full warning sounded only if the user is exceeding the prevailing speed limit. Pogo Alert has been discontinued. Accessories are still available for your Pogo Alert click here. Pogo Alert harnesses the power of orbiting GPS satellites to provide total protection against the threat of fixed speed cameras, mobile laser traps and accident blackspots. Pogo Alert combines cutting-edge industrial design with a high resolution TFT colour screen, custom designed GPS hardware and an intuitive graphical user interface. The result is the most sophisticated speed camera detector ever to take to the road. Pogo Alert utilises the award-winning Origin360 speed camera database, which has been updated since 1999 and contains GPS co-ordinates of ALL fixed installation speed traps, including Gatso speed cameras, Truvelo speed cameras, DS2 (Speedmaster), Watchman speed cameras, Speedcurb speed cameras and SPECS average speed cameras. The Pogo Alert speed trap proximity warning is user definable from 200metres to 2000metres or from 5-30 seconds. Voice warning of camera type/speed limit is provided when in the vicinity of a speed camera. Auto mute setting with adjustable "muted" volume is also available. At each speed camera location the Pogo Alert shows type of speed camera, vehicle speed, speed limit, road number and countdown (metres or seconds) to the speed trap. 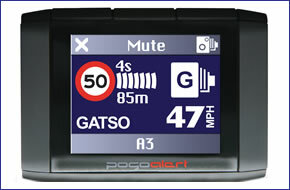 The Pogo Alert can also display distance covered, journey time and average speed. Pogo Alert also includes a highly sensitive infra-red laser detector to provide the fullest protection against laser based speed cameras and 'safety camera vans' via the supplied (removable) laser detector. The Pogo Alert patented 'Directional' feature - alerts are only provided if the warning is applicable to your direction of travel. The Pogo Alert patented 'Limitator' feature - full warning sounded only if the user is exceeding the prevailing speed limit. Screen colour changes to red when exceeding prevailing speed limit (when in range of a speed trap / hazard). Sounds warnings only for speed traps which are sited on the motorway network. Motorway warnings will start further away than normal warnings (factory settings 700metres or 20seconds on motorway mode). Pogo Alert is ready to use - straight from the box. Simply plug the power lead into your cigarette lighter socket and use the suction cup mount to secure the Pogo Alert to the windscreen. Alternatively the supplied dashboard mounting kit allows you to install the Pogo Alert directly on top of your vehicles dashboard. The plug-and-play ability makes it easy to move the Pogo Alert from vehicle to vehicle. Pogo Alert utilises the award winning Origin360 database of speed camera and accident blackspot locations to provide the most accurate and up-to-date information available. Data downloads are carried out via the internet using the download software supplied. Pogo Alert comes with a free six month subscription, thereafter an annual fee of £50.00 applies. In order to update the Pogo Alert safety camera database you will require a PC running Windows 98, 2000, ME, XP or Vista system software and internet access. A very limited range of genuine Pogo Alert accessories are available to buy from ActiveGPS.